The extensive survey done by Criteo for the first quarter of 2018 clearly shows the growing trend in purchase over mobiles. One of the reasons for such acceleration in mobile transactions in Europe are mobile apps. Retailer using mobile apps attribute 55% of all transactions to mobile devices. Europe is not the only continent where purchase on mobile devices have overtaken those made on desktops. Mobiles dominate in most parts of the world – in Asia and the Pacific (75% of all online transactions), Africa and the Middle East (70%), as well as in North America (67%). Customers in Asia, Africa and North America purchase, significantly, more often over apps than over mobile websites. 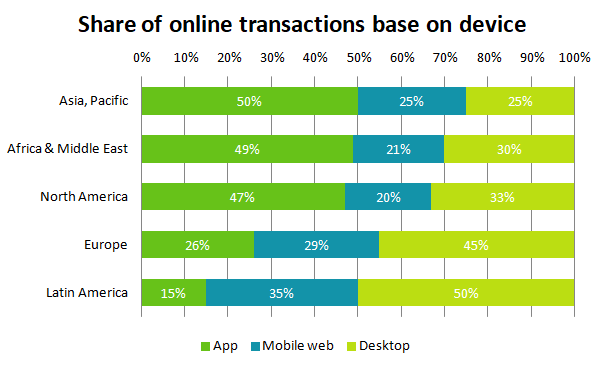 In Europe the ratio of transactions over the mobile web (47 %) to that over apps (53 %) is rather balanced. Latin American customers are just discovering shopping over mobile apps hence their share of online transactions is the lowest. However it is the fastest growing region with a year-over-year increase of 43 %. Mobile transactions do not show such dominance in cases of e-shops that do not have a mobile app. Desktops and mobiles exhibit similar strength in Asia or Africa. 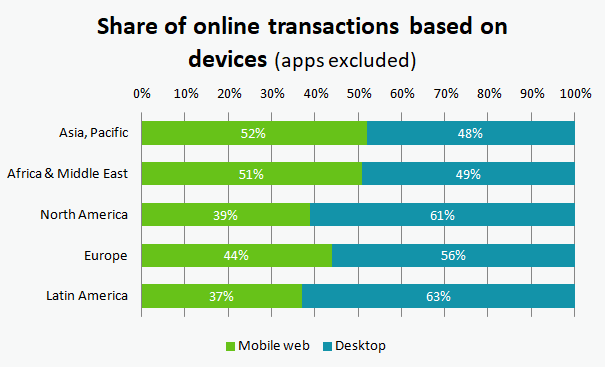 It is different in Europe, we see a higher share of transactions on desktops than on mobile websites. Mobile apps installed on customers mobiles prove to be a motor that drives the global growth of e-commerce. E-shops that have invested into apps, experience a year-over-year increase in transaction of 22 %. Apps generate 47 % of all sales over mobile devices for European online retailers. In Spain, apps account for ⅔ of all mobile sales. USA leads in sales over mobile apps – there transactions over mobiles reach about 70 %. Conversion rate is the mantra of every online retailer. Retailers put in a lot of effort and resources into optimizing it. In this regards mobile apps have an advantage compared to mobile webs and desktops. Apps are used by a smaller but a more loyal group of customers who are strongly motivated to make a purchase. Apps serve them as an ideal option as they are faster, more convenient, and are more reliable to make a purchase no matter wherever they are or whenever they want to. 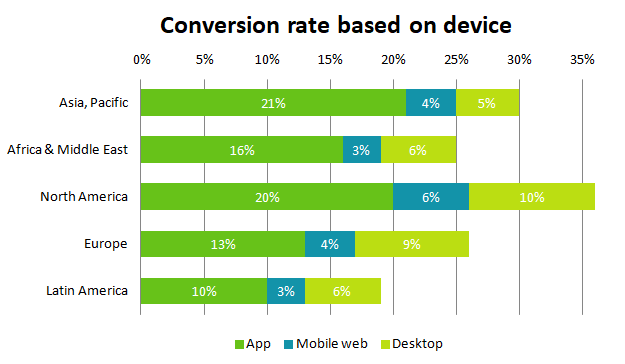 According to survey conducted by Criteo on a worldwide scale, apps generate more than 3x better conversion rate than mobile web. They do better in this aspect even compared to desktops. 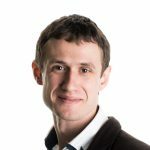 Purchases over mobile devices have clearly been increasing for several years now, and they have been slowly gaining on purchases on desktops in most countries of the world. E-shops that want to grab a big piece of the ever-growing m-commerce, invest mainly into mobile applications. According to the survey done by Criteo, they now account for 26% of the overall turnover in e-commerce. The survey was carried out by Criteo for the first quarter of 2018 which included 5000 retailers in more than 80 countries worldwide. Complete results available here – https://www.criteo.com/insights/global-commerce-review-map/. An enthusiast and a fighter. An man for whom, no river is too wide to cross or mountain too high to climb. And he happens to join us? Must be fatal attraction.